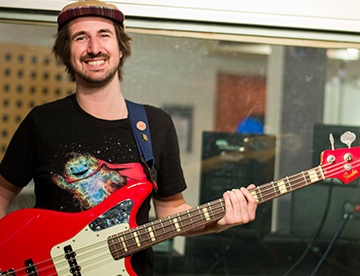 Ryan developed a love for the bass guitar at an early age, influenced by bassist such as James Jamerson, Jaco Pastorius and Marcus Miller. He has played with a multitude of artists and bands, including festival slots supporting artists such as The Levellers, Alabama3 and Dub Pistols. During his time studying he had the chance to study with such great musicians as Paul Geary (Nik Kershaw, George Michael, Simply Red) and Paul Turner (Annie Lennox, Jamiroquai) while working towards his BA Honours degree at the Academy of Contemporary Music. Ryan has recorded with legendary producer John Gallen (George Benson, Queen), Grammy award winning Simon Gogerly (U2, Gwen Stefani) and has gained a wide range of studio experience including work for an up and coming artist signed to Capital Music Groups, Virgin Records. Get in touch with Ryan for bookings, lessons or any other enquiries by using the contact form.